This is yet another in a lineup of unique tension fabric displays. 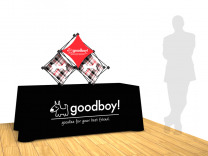 The Sales Mate Table Top Displays offer easily interchangeable tension fabric graphic panels, on an incredibly easy to setup, light weight pop up frame. 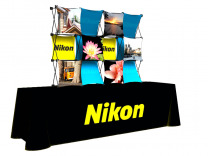 This kit, which is based on the Xpressions Snap graphic portable display system, also features a kit that includes a Perma logo table throw to reinforce your company's brand. Just the Right Size to Impress! 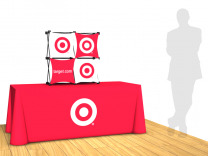 Optima Graphics, who is a supplier of graphics for trade show display distributors delivers their products and services in a different manner than most. What do they do? First and foremost, they understand their customer’s needs, both as a retailer, and a business partner, with a focus on the long term goals of the respective business partners and not the day to day trials. Optimas' goal is to deliver both relationships to retailers in a manner that makes them the vendor of choice in each of their markets. By carefully planning not only future product roll outs, and keeping distributors informed of current trends, has given Optima the means to make the relationship in the present, an pleasurable challenge. Years ago, it was Optimas' bold move into the Lambda printing technology which is used in photo murals for pop up displays, that really got everyone's attention in the trade show exhibit industry. Take note of the dozens of new products they’ve introduced over the years such as the Compass and Sales Mate Table Top Displays, and the VBurst pop up display to name a few. Optima has certainly had a positive impact on the products that flow into the exhibit market. One of the front runners in the online retailers of trade show displays, ShopForExhibits.com, continues to expand what they provide their nationwide clientele, through their display rentals program which was begun only two short years ago, and the new tension fabric products. To sustain this growth, ShopForExhibits has just launched a new web site that provides a host of enhanced customer and product support features. Although the future is anything but certain in this place in time, smart product offerings and reasonable pricing will be most important in order to conquer the challenges ahead. Successfully bringing new exhibit related products to market such as the new tension fabric displays, isn't as simple as one would think, but due to the years of experience with display products and online marketing, ShopForExhibits.com has positioned themselves to lead the pack and be a successful competitor in this industry.